For something a little bit different, this tangy recipe takes advantage of the natural leanness of pork, and then packs a powerful flavor punch with delicious zest of lemon and pickles. Different, simple, and nutritionally balanced! 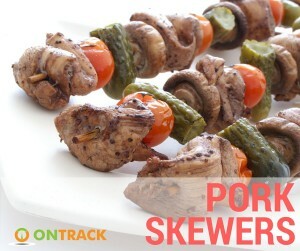 Nutrition: Cal (kJ) Carbs Sugar Fat Sat fat Protein Fibre 503.25(2106) 46.15 21.7 14.42 6.2 40.7 11.55 Ingredients: 1 cup cherry tomatoes 1 cup button mushrooms 200g lean pork tenderloin, diced 1 cup pickles, halved ½ lemon, juiced 2 tablespoons olive oil 2 tablespoons soy sauce 1 teaspoon dried oregano 1 clove of garlic, chopped To serve: Sweet potato mash (3/4 cup each) 1 small sweet potato (cooked) 1 teaspoon light margarine ¼ cup light milk salt and pepper to taste Method: 1: In a large bowl, combine all ingredients, mixing together to ensure an even coating, and then cover and refrigerate for 2-3 hours. 2: Preheat grill to a medium heat 3: Thread all ingredients onto skewers, and cook under the grill for 10-15 minutes, turning skewers every few minutes for even cooking. 4: Serve with sweet potato mash. 4: Serve with sweet potato mash.